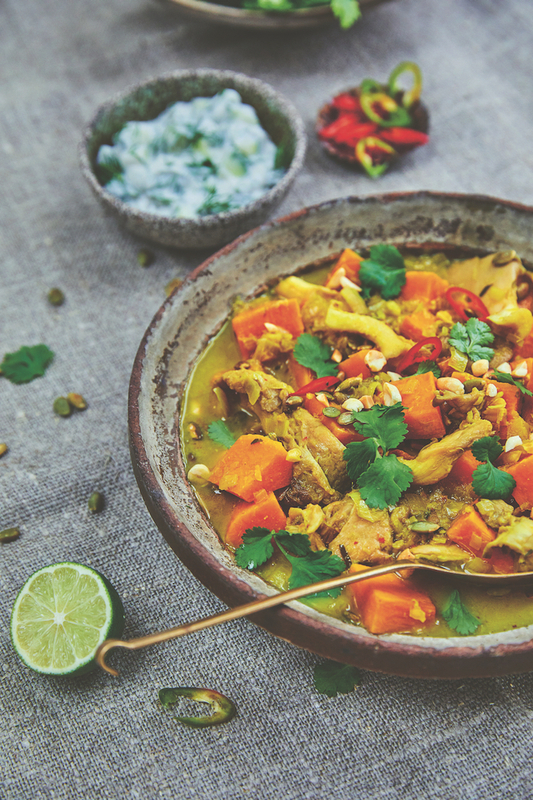 Sweet Potato Mushroom Curry, from Farmacy Kitchen Cookbook. You might recall a recent column about the exponential increase in the number of people following a completely plant-based diet, ie. no meat, eggs or dairy. Among those who haven’t gone down that route completely are a lot of people who are reducing their consumption of meat and dairy, convinced of the nutritional and environmental benefits of doing so. 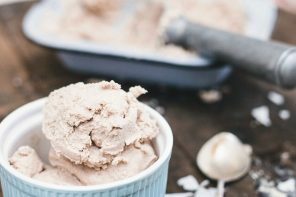 The plethora of vegan cookbooks – or ‘plant-based’ as many of them are called, perhaps because ‘vegan’ sounds like a fringe group – is surely evidence of how popular this style of eating has become. 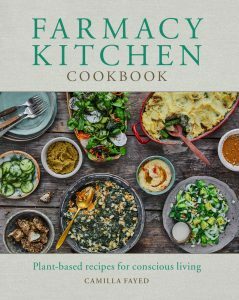 The latest such book to cross my desk is Farmacy Kitchen, by Camilla Fayed, published by Hachette Australia. Sub-titled “plant-based recipes for conscious living”, it is full of inspirational ideas and recipes. Having adopted a plant-based diet after the birth of her first child, Fayed opened a restaurant called Farmacy in Notting Hill, London, in 2016 with a mission to support both local farming and sustainability. Labelled as the “friendly face” of plant-based eating in London, it’s the first of what Fayed hopes will be a string of Farmacy restaurants around the world. Philosopher’s Sauce, Farmacy’s take on Asian fish sauce. She and her team are constantly experimenting with new dishes and ingredients, and many of their most popular feature in the Farmacy Kitchen cookbook, including an adaptation of the Farmacy burger, the number one choice on the restaurant’s menu. (It’s made with black beans.) The book has chapters on appetizers and soups, mains, basic sauces, salads and sides, and some luscious desserts. There is even a chapter of recipes for home and beauty products such as body butters, scrubs and cleansers. 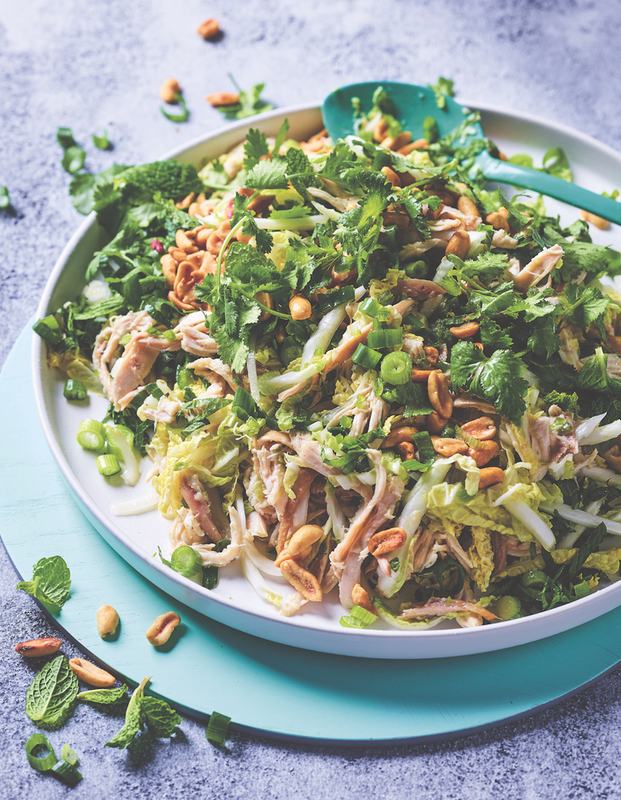 The Thai-inspired recipe here is colourful and bursting with goodness. 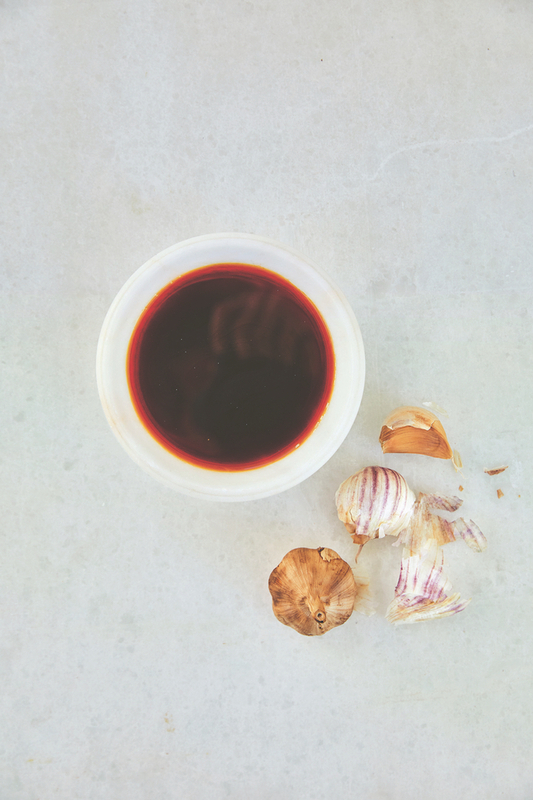 It gets its deep umami taste from Philosopher´s Sauce, Farmacy’s take on Asian fish sauce. The sauce is made with Seaweed Broth, and instructions for both follow. To make the curry, sauté the shallots and garlic in the oil in a heavy-based saucepan over a medium heat until they are translucent. Do not let them colour. Add the curry paste and ginger and cook for 1 minute. Add the vegetable broth, sweet potatoes and lime leaves and bring to the boil. Reduce the heat and cook for 10 minutes. Then add the mushrooms, the peanuts and the coconut milk. Stir in the Philosopher’s Sauce and the coconut nectar. Allow to simmer for 5 minutes. Test whether the sweet potatoes are done and simmer longer if necessary. Turn off the heat under the saucepan, cover and allow to rest for 20 minutes. Serve the curry garnished with dry toasted pumpkin seeds and coriander leaves along with a dollop of raita, and lime halves for squeezing over. To make Philosopher’s Sauce: Place in a saucepan 500ml (18fl oz) Seaweed Broth (see below), 1 black garlic clove (crushed), 2 garlic cloves (crushed), 1¼ tbsp salt, 60ml (4 tbsp) tamari and 1 tsp sherry vinegar. Bring to the boil then lower the heat to a simmer and reduce the liquid to half the amount. This will take about 15 minutes. Store in a dark, dry cupboard for up to three months. This sauce doesn´t need to be refrigerated. To make Seaweed Broth: Soak 2 pieces of dried kombu, each about 15cm (6in) long, overnight in 1¼ litre (2 pints) water. Put the soaked kombu and water into a saucepan over a low heat and slowly bring the water to a boil. Just before the water boils, remove the kombu (it’s important not to boil kombu or it will become bitter). Keep the kombu as it can be reused one more time before needing to be discarded. When the water boils, lower the heat to medium and add 4 pieces of dried shiitake mushroom and ½ tbsp salt. Cook for 1 minute, skimming the surface, then turn off the heat. Let the saucepan stand for an hour, then strain and reserve the broth. Store for up to a week in a sealed jar in the refrigerator. 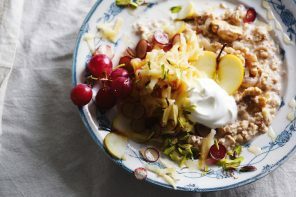 Recipe and images from Farmacy Kitchen Cookbook, by Camilla Fayed. Published by Hachette Australia and reproduced with the publisher’s permission. This sounds like my kind of dish! My family loved this and asked for more, Thanks for posting!